The landing page, home page, or front page if you will, can be set to open any published page, and can be changed when ever you choose. For example, say you have an event coming up, to promote you can make it the first thing people see when they come to your site. Set it to be the landing page, then when the event is over, change the page to be any one of your other pages. This is a way to vary your site from time to time and keep things fresh. To do this go to Settings>Reading. If you are using WordPress for a website only; in other words just static pages with no blog; then just follow steps 1 and 2 below. If you have a blog as well as static pages (typical website) and want a static page as the landing page of your site, you first need to create two pages (see create new page). One will become the home page, and the other will be where your posts are displayed. Pick an existing page from the “Front Page” drop down menu. This will now be your Home (landing) page. When you create the page for your blog, it is important that this page remains blank (no content) with a title only. Name it what ever you want. “Blog”, “About my Work” or “Musings”, what ever you like. 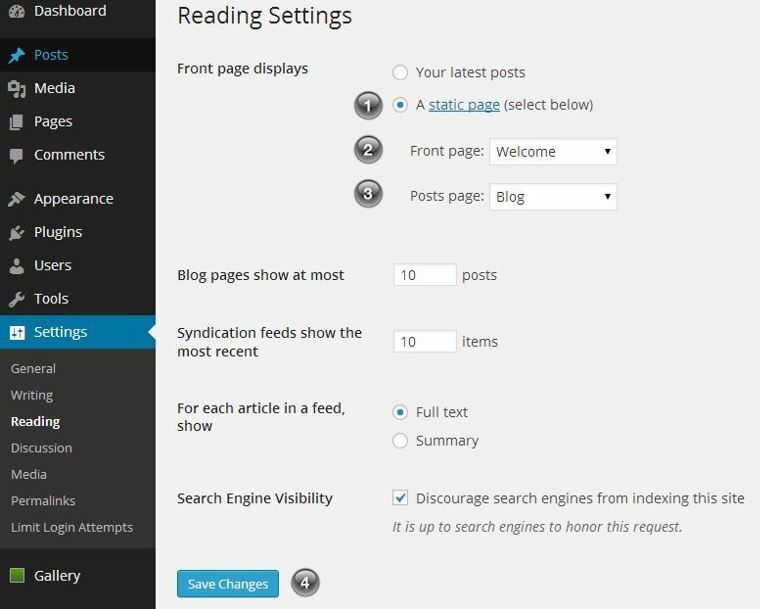 WordPress will dynamically bring your blog posts into it. Select it from the drop down menu next to “Posts Page”. Next: Navigate to Appearance>Menus and add the newly created “Blog” page to your menu and save. The landing page can also be posts in reverse chronological order (classic blog). To do this simply select “Your Latest Posts” and ignore steps 1 thru 3. Blog Pages Show at Most lets you control how many posts will be displayed on the blog landing page before a next page link appears. Encoding – there is no need to change this unless you know what you are doing, so don’t. For Article in a Feed show – Full text or a summary. Chose summary, then readers will come to your site to read the rest. Feed syndication is a system that allows people to use readers to access your information remotely. There are other settings but please be aware that if Artbiz set up WordPress for you all these settings have been…well, set. You don’t have to do a thing. A simple way to back up your content is next. I have a problem. I am working on my own website and when I went to add the blog to the menu I got this message: The current theme does not natively support menus, but you can use the “Custom Menu” widget to add any menus you create here to the theme’s sidebar. Any idea what I can do to get all my blog posts to the blog page? The blog “Page” that you created acts as a container for WordPress to dynamically pull in your blog “Posts” and display them. When you use a “Page” as the landing page of your site, you need to tell WordPress which page to use to display your “Posts”. To do this go to Settings > Reading and select the page you want from the drop down menu.